Today, humanity is entering the era of a new industrial revolution. Modern technologies change the world. Global technological shifts carry both challenges and new growth opportunities. This is our historic chance for accelerated entry into the list of the 30 most developed countries in the world. Tomorrow will be published my annual Message to the people of Kazakhstan. It is devoted to the development of the country in the conditions of the Fourth Industrial Revolution. I see 10 main tasks that we have to implement. I want to briefly state their essence. First. Kazakhstan’s industry should become the flagship of the introduction of new technologies. Our industry needs to increase the level of labor productivity through the digitization of production processes and the development of modern business models. The second. It is necessary to significantly improve the efficiency of resource use. It is required to implement information technology solutions. They will allow increasing the share of extracted resources, the depth of their processing, as well as increasing the energy efficiency and environmental friendliness of production. Fifth. Application of modern technologies in construction and housing and communal services. New construction methods, increasing the requirements for energy efficiency of buildings, intelligent infrastructure management systems will improve the quality of life of Kazakhstani people. The sixth. “Reloading” the financial sector. Measures to improve the banking system should be accompanied by increased supervision and take into account the interests of ordinary citizens. It is necessary to significantly increase the responsibility of those who own banks and those who manage them. It is required to expand lending and ensure the development of the stock market. Seventh. A new quality of human capital. All levels of the education system must meet the current realities and needs of the economy. At the same time, it is necessary to increase the prestige of the teacher’s profession. In healthcare, the use of new technologies should significantly improve the prevention and treatment of diseases, and improve the quality of medical care. In 2016-2017, social payments were increased three times. Including basic pensions – by 29%, solidarity – by 32%, salaries of health workers increased to 28%, education – up to 29%, civil servants – by 30%. In the current year, the budget expenditures for the social sphere are increased by 12% and exceed 4 trillion tenge. The base pension will increase by an average of 1.8 times, taking into account the length of service. The salaries of teachers who have switched to training within the framework of the updated content of training programs will grow from 30 to 50% depending on the confirmed qualification. Eighth. This is effective public administration. Digital technologies will allow to continue the deregulation of business, improve the quality of public services and state support, more fully take into account the needs of citizens. The economic independence of regions and local self-government will be expanded. The ninth. The rule of law and the fight against corruption remain priority areas of state policy. The tenth. The introduction of Smart City technologies will effectively solve the problems of growing cities and increase their attractiveness for investors. Today, we all have to concentrate on solving these ten problems. 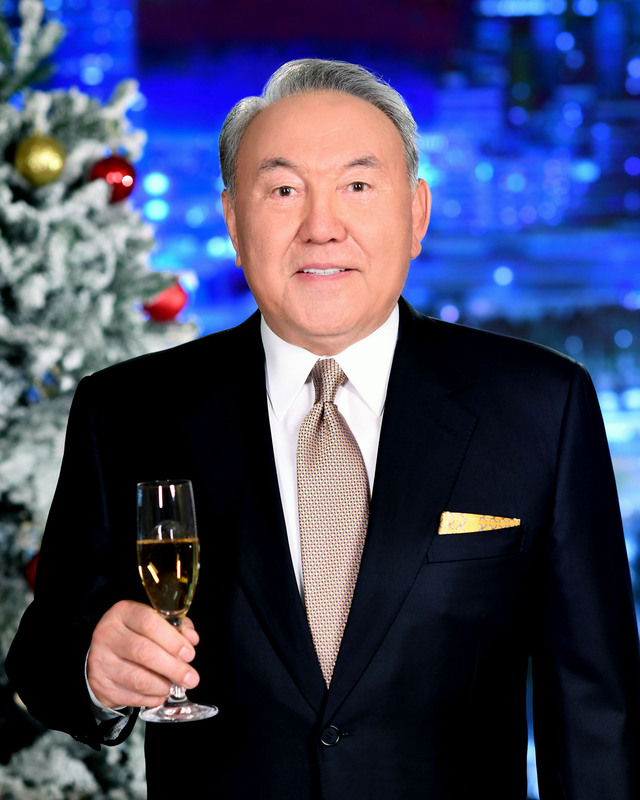 Congratulation of the President of Kazakhstan Nursultan Nazarbayev with the New Year 2018! We are happy to celebrate the New Year in our big common house – the Republic of Kazakhstan. This bright holiday gives us warmth of communication with family and friends, friends and colleagues. Today, each of us sums up the results, makes wishes and plans for the future. In these moments 2017 goes down into history. We’ve lived it very richly, dynamically and brightly. Every Kazakhstan family had its own happy moments and joys, which will stay in their hearts for the rest of the life. Delight and admiration overwhelmed us in sports arenas Winter Universiade, we looked at an interesting future in the pavilions of the international exhibition EXPO. Kazakhstan has become more famous and respected all over the world. Our efforts in the UN Security Council and within the framework of the process of Astana to contribute to peace and settlement of the Syrian crisis. We reached an important milestone – the eighteen millionth resident of the country was born. This is a historically significant event demonstrating the successful development of independent Kazakhstan. In the outgoing year, we’ve done everything to strengthen positive changes in all spheres of life of our citizens. The constitutional reform strengthened the role of the Government and Parliament. New industrial projects have been introduced, the transit potential and digitalization of the country are gaining strength. Pensions and other social payments yfs been increased. All these important achievements of the country are the merits of each of us. I would like to sincerely thank all Kazakhstanis for their demonstrated unity and accord, energy and work. Only by joint efforts we reach new heights! In the coming year, we will continue the course of changes, creating a prosperous Kazakhstan. The International Financial Center “Astana” will start its activity. A significant event will be the 20th anniversary of our beautiful capital, the main symbol of the achievements and victories of our country. With its rapid pace of development, it sets the rhythm of renewal for all Kazakhstan. Very soon, the New Year 2018 will enter our homes! From the bottom of my heart I wish you happiness, health and prosperity! Addressing the present, the Head of State has noted that the New Year celebrations always gives positive energy and hope for a better future. – The year that is now ending will be best remembered for its bright and large-scale events. The Winter Universiade and the EXPO-2017 international exhibition have been a real festival of sports and technology to Kazakhstan’s citizens and foreign guests. We have held the Summit of the Organization of Islamic Cooperation at a high level, the President of Kazakhstan said. 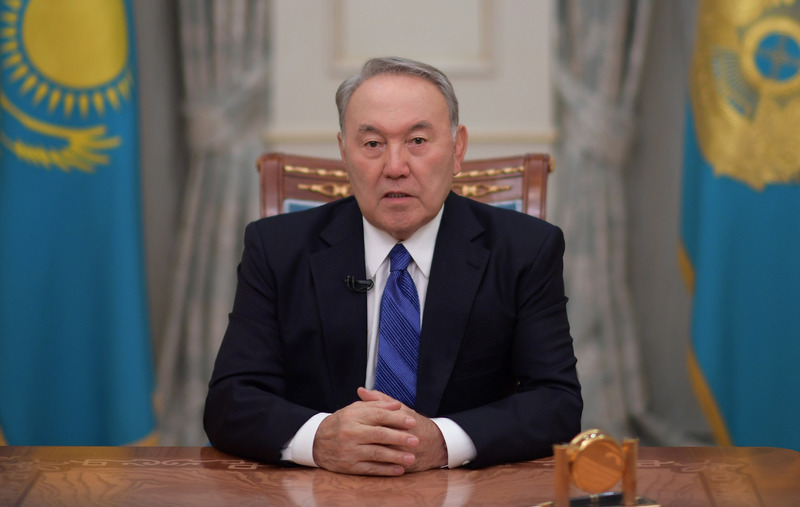 Nursultan Nazarbayev dwelled separately on the issues of promoting peace initiatives of our country in the UN Security Council and the prospects for Kazakhstan’s forthcoming chairmanship in this international institution the following year. – This is the privileged trust to the young state, shown by about two hundred countries of the world. Next year, the Congress of Leaders of World and Traditional Religions, the Conference on Interaction and Confidence-Building Measures in Asia and many other significant events will take place in Kazakhstan, and you will see them. All these gains are the result of the efforts and hard work of each of us. It is important that every citizen feels involved in the achievemnets of Kazakhstan, the Head of State said. 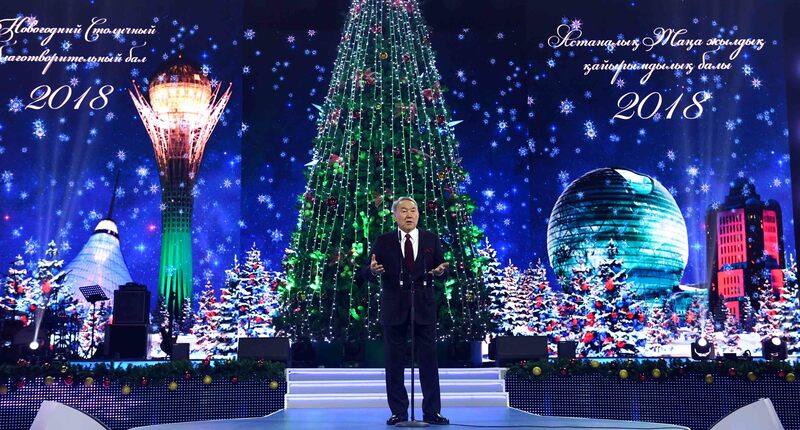 In conclusion, Nursultan Nazarbayev congratulated those present on the coming New Year and wished all the people of Kazakhstan health, joy and happiness. – Let our houses be filled with light of good and warmth of well-being, the President of Kazakhstan said. 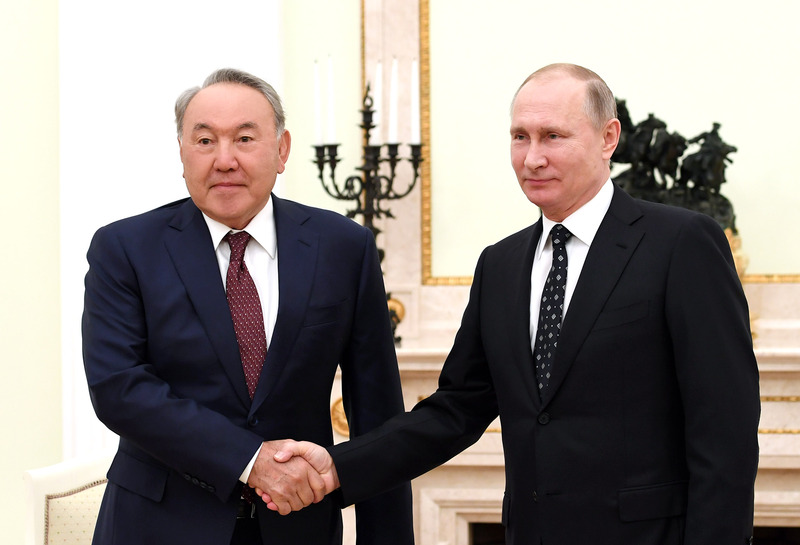 Nursultan Nazarbayev thanked Vladimir Putin for the invitation to take part in the informal summit of CIS heads of state and noted the fruitfulness of the talks. – There are no issues between our countries that remain unaddressed. Over 26 years of independence of our states, we have only become closer, created a treaty base and normal conditions for mutual cooperation, the President of Kazakhstan said. The Kazakh leader has also separately dwelt on the Eurasian integration issue, along with mentioning the productive nature of cooperation between Kazakhstan and Russia. – We agreed on all the matters, including the Caspian Sea, on the Baikonur Cosmodrome. In the field of space exploration, it is planned to create launch vehicles of a new type operating on more environmentally friendly fuels, Nursultan Nazarbayev said. In his turn, the President of the Russian Federation noted the successful development of bilateral relations and thanked Nursultan Nazarbayev for the initiative to hold a meeting of high-level experts on digital technology development in Kazakhstan. – The trade turnover growth between our countries for 10 months of this year has amounted to more than 34%. More importantly, and exactly this is aimed at the future: this is our cooperation, our joint work in the field of digital technology. Kazakhstan has been and remains our key partner in the spheres of economy, regional and international security, as well as ensuring the defence capacity of our countries, the President of Russia said. During the meeting, the two leaders have also discussed cooperation in energy, space exploration and the digital economy.